From Facebook/my post: Something interesting…after talking to a friend and providing feedback/suggestions on the issue of Cued Speech, I decided to look at my coded sign systems presentation to confirm something… All of the coded systems were created before 1988 (Deaf President Now), approximately 30 years after the linguistic recognition of ASL. The only coded system created after DPN is Conceptually Accurate Signed English (CASE), which borrows heavily from ASL while maintaining the idea of English grammar structure. The education system for deaf children needs to heed what is already true…successful citizens need full language access, meaning bilingualism is critical for deaf children. Language is the ultimate tool, all others are simple tools to achieve the use of language in the real world. Cued Speech uses what ASL already employs in its function as a true language, the basic function of how language is built. We call this parameters, which functions as phonology structure of language. Cued Speech uses handshapes, location and movement. The purpose of Cued Speech is to provide English language into a visual mode. In English, 30 percent of the language can be read on the lips, all else requires knowledge of topic, familiarity with person’s lips and the expressive ability to ensure as much information is transmitted. CS is limited to 13 handshapes and three locations/movements. Those bring out the ‘hidden’ aspects of English – the invisible letters/words that are difficult to see, such as ‘N’ or ‘map/bap/pap’. Contrary to beliefs, the use of spoken language is not required, easy to do yes, but not required. I really do not want to harp on this specific tool. I want to bring to light the significance in timeline in how signed systems came into place after the melding and evolution of American Sign Language began in early 1800’s. The start of ASL’s melding from different sign languages (Old French Sign Language and indigenous village sign languages, such as Martha’s Vineyard SiL) at American School for the Deaf in 1817 has continued to evolve over years, naturally human influenced. In 1880; International Congress on the Education of the Deaf (ICED) met in Milan, Italy (also known as Milan Conference of 1880) to place a ban on sign languages being used to teach subjects in school – globally. 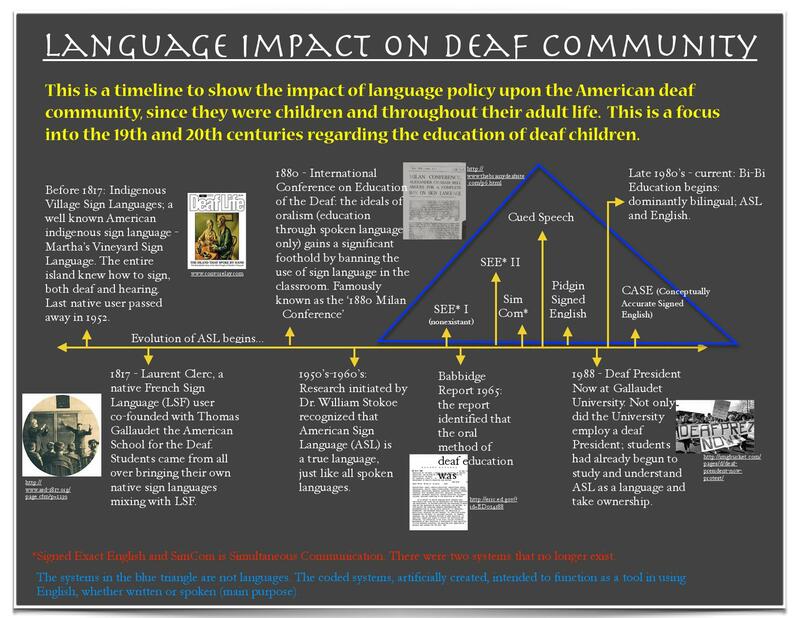 A noticeable difference in the quality of education for deaf children was not recognized until 1920’s. In 1965, a report was released from the Department of Health, Education and Welfare (mind you, 1965) outlining how the method of teaching deaf students using the oral method was not a success. From this time and on until before 1988, a total of 8 signed systems were created, in order to help deaf children learn English. At the same time of this Babbidge Report, research has already shown that ASL is a bona fide language that deaf people had a hard time accepting that their language was an authentic language, conditioned by English/spoken dominated society, since 1880. This was despite the fact that ASL continued to be used among native/natural ASL users (whether be Deaf, deaf, hard of hearing, CODAs or hearing) in the community. This rash of signed system inventions stopped in the late 1980’s, particularly I believe sometimes before Deaf President Now in 1988. The only invented signed system after this period is Conceptually Accurate Signed English (CASE); which borrows heavily from ASL while strictly maintaining the English grammatical structure. What is the difference between ASL and the signed systems? ASL has been around for more than 200 years and has evolved from a myriad of existing languages and has been embraced by children of any age. I can tell you this from my experience growing up in a deaf and hard of hearing program before going to my alma mater and my questioning of others who went through similar programs that children take a strong reprieve from the use of signed systems, naturally, such as recess, break times, side conversations and the like, using a form of language which is similar to ASL. That is why when those students graduate from mainstream schools with the ability to transition between signed systems and the peered ASL, they have the easiest time being accepted and adapt to full ASL because they have already developed their social language with their peers, which unfortunately is less true today as most deaf children are isolated in their schools. Signed systems are based on the spoken English language, it is not natural. Also these systems have been created mid 20th century. While they may have the nice goal of building literacy; however, are often taken the wrong way. The main goal is to produce speaking deaf people, not literate, functioning and contributing citizens of the world. With signed systems, children cannot play, be naturally creative or produce new signs that fit their generation (fads/slang). They can do this with ASL and English. Children makes the language go around, adults take their experience and make their language static, often struggling with dismay or amusement with their children when they ‘play’ with language. The brain knows what it is doing, deaf or hearing. That is why children struggle against something that does not make sense to them, they will find a way to make it simple, creative, and understandable. (http://oes.gallaudet.edu/bl2/; Dr. Laura Petitto) That is the flexibility we leave behind as we become adults.